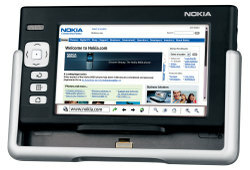 I managed to get my hands on a fairly cool device, the Nokia 770 Internet Tablet. The picture above doesn't do it justice, but it's a small Internet tablet with built-in WiFi and a beautful crisp screen running 800x480 resolution. It weights just 8 ounces (230 grams) and can be easily carried in a jacket pocket. Since the device is from Nokia, you might guess that it has basic phone capabilities or GPRS based web surfing, but it doesn't. However, if you have a bluetooth enabled phone, you can surf via your phone. After a couple of days experimenting, I don't think this will replace my existing Palm Treo phone or Sony Vaio laptop, but I'm still impressed with it. It offers the Opera browser, simple email, a nice RSS newsreader and good multimedia capabilities including Internet Radio and video player, a built-in speaker and headphone jack. That's not to say the 770 doesn't have it's shortcomings. I would dearly like to see a a clamshell design with a keyboard I could type on as well as faster boot time. Not to mention some actual PDA software for calendar, contacts, note taking etc. 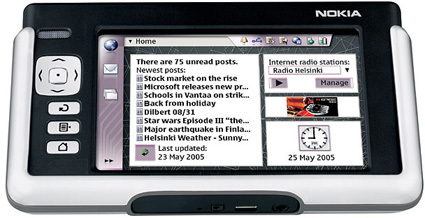 The other interesting thing about the Nokia 770 is that it's software is completely open source and available online at www.maemo.org operated by Nokia. (Apparently the name Maemo doesn't mean anything, it was randomly generated. I guess that's cheaper than paying a marketing firm to come up with an equally meaningless name.) The software is based on the Linux 2.6 kernel and Gnome UI. So perhaps there will be a community that grows around this and enhances the software to make it more powerful. Certainly, the email program needs some more advanced capabilities to be more useful. There's an application catalog available online. Meanwhile there are rumors Microsoft and perhaps Apple will get into the the "ultraportable" category of handtop computers. Microsoft has their Origami Project with an announcement scheduled for March 2nd and a concept video leaked out on the internet through a design agency. And while Apple continues to deny any interest in handhelds or tablet PCs, they do have some filings with the US Patent and Trademark Office suggesting to the contrary. Maybe some competition will fire up the market to come up with more interesting small form factor computers. I've been looking for the perfect handheld device for something like 20 years and it still amazes me that there's nothing quite right. I must have owned or tried every pocket PC device including the Atari Portfolio, Poqet PC, HP 200LX, Psion 3, Psion 5, Sharp's Intermec 6651, Franklin Rex and various Palm PDAs and phones along the way. Ok, so I admit, maybe this may just be a personal problem I have. Last year's OQO looks interesting, but it runs Windows XP which makes it kind of a dog when it comes to performance and battery power. Also, it's got a pretty lame thumb keyboard. Paul Allan's FlipStartPC wins the vapor award of the decade for announcing a 1 pound handheled at the Demo conference in 2004 and two years later there's no sign of it shipping. Maybe with Microsoft's new platform, they'll get something to market. 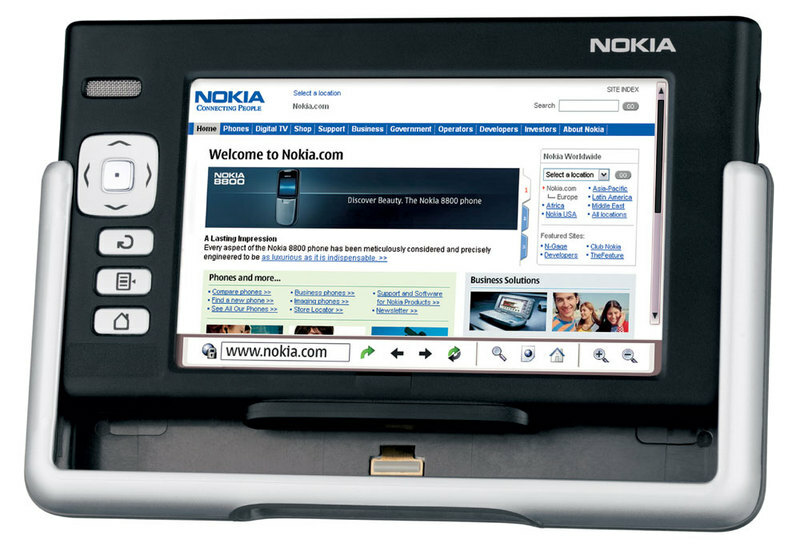 Microsoft has now announced their Universal Mobile PC (codenamed Origami) and so far the results look underwhelming. It's not small enough to fit in your pocket, it's not powerful enough to be a laptop and it's not cheap enough to be third device in addition to a phone and laptop. It's unfortunate that they had so much buzz and delivered so little. ABC News: Is Oragami Just a Paper Tiger?